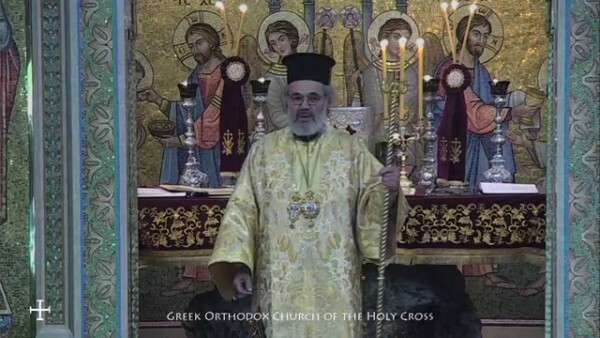 SAN FRANCISCO – His Eminence Archbishop Demetrios of America announced today (May 29, 2015) with great sadness, during the meetings of the Archdiocesan Council, the falling asleep in the Lord of His Grace Bishop Anthimos of Olympos, age 80, in his residence in West Yarmouth, Massachusetts. Following the announcement the Archbishop offered a trisagion memorial service, in the Archdiocesan Council meeting room. Born as George Draconakis in Kasteli, Crete on November 19, 1934 to Nikolaos and Kalliope, he was drawn to the church from a young age and followed the calling of the Lord. He was a graduate of the Patriarchal Theological School of Halki where he received his Master of Divinity degree. He was ordained to the Diaconate in 1954, and to the Holy Priesthood in 1956. He was elevated to the rank of Archimandrite in 1959. He served parishes in Belgium where he studied at the Catholic University of Louvain. From 1960 – 1969 he was assigned to the Archdiocese of Germany in several capacities and served parishes in Berlin and Nuremberg before being appointed as the Archdiocese Vicar. In July 1969 he arrived in the United States and was appointed as the parish priest of Saint Nicholas Greek Orthodox Church in Clinton, Massachusetts. During this time he continued his education at the Harvard Divinity School. In July 1971 he was appointed Dean of the Archdiocesan Cathedral in New York City, where he served until his election as Bishop in 1977. From the time of his election through 1979 he served as Bishop of the Diocese of Pittsburgh. He was enthroned as Bishop of the Diocese of Boston in April 1979 and served there until he was enthroned as the first bishop of the Diocese of Denver in 1983. Bishop Anthimos was a close friend of Metropolitan Anthony of San Francisco of blessed memory, both having been born and raised in Crete. His Grace was a frequent visitor to the Metropolis of San Francisco. He loved attending the annual Folk Dance and Choral Festival; was a great supporter of Saint Nicholas Ranch and Retreat Center and the Monastery of the Theotokos the Life Giving Spring in Dunlap, California; and was a beloved friend and spiritual father for many faithful through the country. Bishop Anthimos is survived by his brother, Rev. Fr. Konstantinos Draconakis, who had served as a priest in Germany for many years, and is now retired and resides in Crete. He had expressed the wish to be entombed in his motherland, in Kasteli Fournis near Neapolis in Crete. May his memory be eternal! Funeral and viewing arrangements will be forthcoming.